Glenn R. Conrad, U.L. professor and director of the Center for Louisiana Studies, has been honored by the Acadian Museum for his life-long efforts in researching and documenting the Cajun and Creole legacy. Conrad, who received his masters degree from Georgetown University in 1959, focuses his teaching on archival studies, 19th century European history and the history of colonial Louisiana. He has been a member of the faculty at the University of Louisiana at Lafayette for 36 years. His primary area of academic interest is Louisiana history and culture from colonial times to the present. This interest has resulted in over 40 scholarly articles and 20 books ranging in subjects from colonial immigration to major reference works such as the two-volume Dictionary of Louisiana Biography and the now-in-production 20-volume Louisiana Purchase Bicentennial Series in Louisiana History. His most recent publications are volume 1 of the Louisiana Purchase Bicentennial Series entitled The French Experience in Louisiana and White Gold: A Brief History of the Louisiana Sugar Industry, 1795-1995. He has recently published a biography of Dr. James White, early judge of the Attakapas District, father of Louisiana Governor E. D. White, and grandfather of United States Supreme Court Chief Justice E. D. White. He is presently conducting research into the lives of “free people of color” in antebellum St. Martin Parish. Jim Sefcik, Director of the La. State Museum at the Cabildo said, “Ever since I came to Louisiana in 1987, Glenn Conrad has been Mr. Louisiana History. He has been the glue that keeps it all together. He is well respected by both academic historians and those less formally trained. He is also an excellent administrator who keeps the Louisiana Historical Association running smoothly. The publication program of LHA will be the lasting historical legacy of the Louisiana Purchase Bicentennial celebration for years to come. Glenn Conrad is also a very nice person and a true Living Legend! Conrad was Managing Editor of Louisiana History, the journal of the Louisiana Historical Association, from 1973 to 1993, resigning that position to become Secretary-Treasurer of the Association. He is chairman of the state review committee of the National Register of Historic Places, Secretary-Treasurer of the Attakapas Historical Association, and chairman of the New Iberia Historic District Commission. 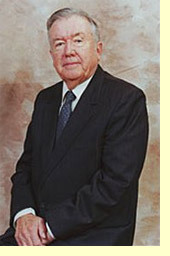 He is the recipient of numerous professional and civic awards, the most recent being the Louisiana Endowment for the Humanities, Humanist of the Year, 2001.